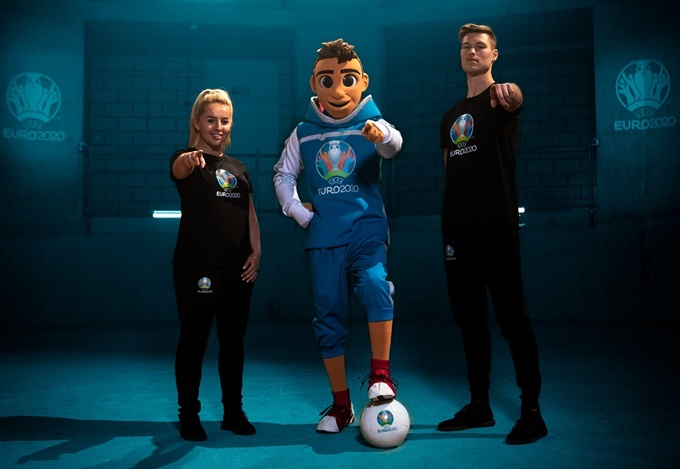 UEFA have unveiled the official mascot for Euro 2020 and that’s him right up there – the chap in the middle, who goes by the name of “Skillzy”. Skillzy made his debut ahead of last night’s Euro 2020 qualifier between the Netherlands and Germany, taking to the pitch in Amsterdam alongside freestyle cronies Liv Cooke and Tobias Becs. According to UEFA’s accompanying blurb, the trickster is a “larger-than-life character inspired by freestyling, street and panna culture”. Aren’t pannas just nutmegs by a different name? Is there a ‘nutmeg culture’ now? Are we actually as ancient as we feel? A freestyler named ‘Skillzy’. That must have taken all of 10 minutes to come up with. Maybe we’re just getting old, but it definitely feels like tournament mascots are getting less and less charming (and memorable) with each passing competition. At least they didn’t call it ‘Tekkers’. Panna is a game based on nutmegging your opponent.